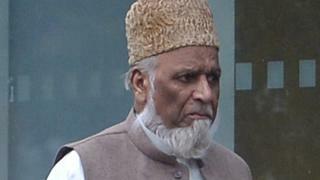 A former imam at a Cardiff mosque who sexually abused children has had his prison sentenced reduced by four years. Mohammed Saji Sadiq, 81, was jailed for 13 years in July after being found guilty of 14 counts of abusing children aged 11 and under. Mr Sadiq, from the Cyncoed area of the city, taught Koran Studies at the Madina mosque between 1976 and 2006. An attempt to overturn his conviction failed on Thursday, but his sentence was cut to nine years. Following a trial at Cardiff Crown Court the former part-time imam was found guilty of eight sexual assaults on a child under 13 by touching, and six indecent assaults. The allegations involved four girls and were said to have taken place between 1996 and 2006 at the mosque, then situated on Woodville Road in the city. Appeal court judges sitting in Cardiff dismissed his claim over his convictions. The Lord Chief Justice of England and Wales Sir Ian Burnett said he, Mr Justice Clive Lewis and Mrs Justice Nicola Davies were all in "no doubt the convictions are safe". But he said the sentence was too high and reduced it to nine years.